Gold for photonics; organic electronics send body signals for pain relief; autonomous semi trucks. 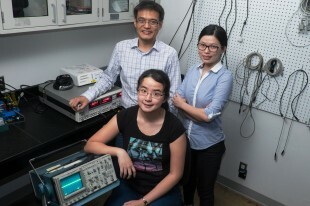 A new method developed by Rice University researchers for tuning the light induced vibrations of nanoparticles through slight alterations to the surface to which the particles are attached could open doors for new applications of photonics from molecular sensing to wireless communications. The researchers at Rice’s Laboratory for Nanophotonics (LANP) collaborated with researchers at the University of Melbourne in Victoria, Australia and used ultrafast laser pulses to induce the atoms in gold nanodisks to vibrate. These vibrational patterns, known as acoustic phonons, have a characteristic frequency that relates directly to the size of the nanoparticle. They found they could fine-tune the acoustic response of the particle by varying the thickness of the material to which the nanodisks were attached. The team lead said the results point toward a straightforward method for tuning the acoustic phonon frequency of a nanostructure in the gigahertz range by controlling the thickness of its adhesion layer. Heating nanostructures with a short light pulse launches acoustic phonons that depend sensitively on the structure’s dimensions and thanks to advanced lithographic techniques, experimentalists can engineer plasmonic nanostructures with great precision. Based on the results, it appears that plasmonic nanostructures may present an interesting alternative to conventional optomechanical oscillators. Researchers at Swedish universities Linköping University and Karolinska Institutet have developed a small ion pump in organic electronics that can stop pain impulses in living, freely moving rats using the body’s own pain relief signals. The implantable “ion pump” that delivers the body’s own pain alleviators with exact dosage precisely to the location where the pain signals reach the spinal cord for further transmission to the brain, could be in clinical use in five to ten years. 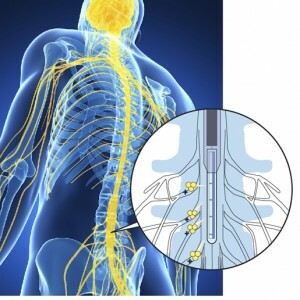 The researchers said the device gives hope to the seven percent of the world’s population suffering from nerve pain for whom no other cure has been found – until now. But the pump could also be used to supply therapeutic substances to the brain and other parts of the body in addition to the spinal cord. The ion pump can be likened to a pacemaker, except for alleviating pain, they explained. While a pacemaker sends electrical impulses to the heart, the ion pump sends out the body’s own pain alleviator – charged molecules of what are known as neurotransmitters – to the exact place where the damaged nerves come into contact with the spinal cord. This means that the pain impulses never reach the brain. In this case, the device delivered the neurotransmitter γ-aminobutyric acid (GABA), whose natural task is to inhibit stimuli in our central nervous system. The implant is constructed using organic electronics – a class of materials capable of easy translation between electronic and biochemical signals. Last week at Hoover Dam, Daimler Trucks North America unveiled the Freightliner Inspiration Truck — the first licensed autonomous commercial truck to operate on an open public highway in the United States. It promises to unlock autonomous vehicle advancements that reduce accidents, improve fuel consumption, cut highway congestion, and safeguard the environment. The company stressed this is not a driverless truck—the driver is a key part of a collaborative vehicle system: they can optimize their time on the road while also handling other important logistical tasks, from scheduling to routing. The autonomous vehicle technology not only contributes to improved safety and efficiency, but allows for improved communication through connectivity and integration. The truck operates on highways at what the National Highway Traffic Safety Administration defines as Level 3 of autonomous vehicle capabilities, enabling the driver to cede full control of all safety-critical functions under certain traffic or environmental conditions. The autonomous vehicle system is responsible for maintaining legal speed, staying in the selected lane, keeping a safe braking distance from other vehicles, and slowing or stopping the vehicle based on traffic and road conditions. The vehicle monitors changes in conditions that require transition back to driver control when necessary in highway settings. The driver is in control of the vehicle for exiting the highway, on local roads and in docking for making deliveries.